Some Passiflora species, e.g. fresh wet species from warmer climates may have no inhibitors at all. I don’t think anyone knows. We will assume they are there however for the purposes of this article, especially in tropical species that have dried out. Some dried out species e.g. P. kermesina are certainly very very difficult to germinate. The inhibitors stop the seed from germinating too soon, e.g. while still inside the fruit, inside an animal’s digestive system, over winter or while it is too dry or cold. The most common inhibitor in temperate plants is abscisic acid, a plant hormone, which induces dormancy in the embryo. There may also be other inhibitors. The plant ‘judges’ it so that seed from fruit ripening in autumn takes all winter for the enzymes in the seeds to degrade the abscisic acid. By spring or later, the abscisic acid is gone and the seed can sprout. I have seen this with Passiflora ‘Adularia’ seed. The fruit fell to the ground in late September (autumn) & the tiny seed came up from the flower bed en masse the following August. It is difficult to believe that anything other than inhibitors could have kept such tiny seed dormant so long. For seed to germinate, the inhibitors found in the seed coat have to be overcome by leaching them out. This then enables the seed to release the germination promoting plant hormone gibberellic acid. This acts on the aleurone layer inside the seed coat to stimulate alpha-amylase production. This enzyme then starts to break down the stored starch (water insoluble) in the endosperm of the seed embryo into simpler water soluble sugars. The embryo meristem tissues use the energy from these sugars to begin cell division and the seed then sprouts. In many plants, including Passiflora, the seed are variable in speed of germination to maximize chances of survival in fluctuating conditions. In one batch of some species, e.g. Passiflora antioquiensis, it is not uncommon for some to come up quickly & others up to a year later. There is some evidence that hybrid seed may come up more easily than the maternal species seed either selfed or crossed with another clone of the same species, especially if the male is P. caerulea. Some seed that will germinate wet from the fruit may as noted above become dormant if dried. It may then need a simple presoak or stratification as below to encourage germination. So if you have fresh seed to share, send it either in the fruit or wet in tiny self seal ziplock bags with little air in them. It is also very important to make sure that once the germination process starts the seed are kept moist..if they dry out again they may become unviable. Stratification is the term given to trying to mimic or speed up the over-wintering process by storing the seed in moist sand (see previous page) & refridgerating for between 4-12 weeks before sowing. This is sufficient time to break down the abscisic acid. Then the seed are moved to a warm sunny location, they think its Spring & off they go. Some seed may benefit from this e.g. P. incarnata & P. lutea. 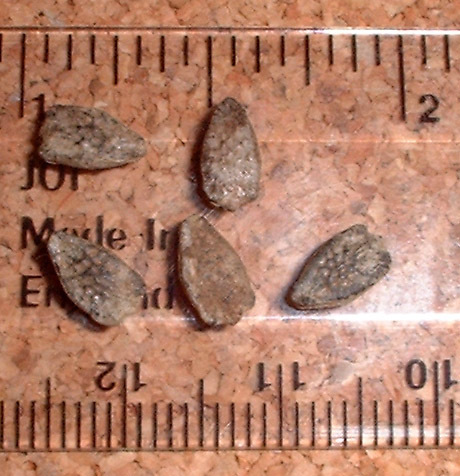 Note that even some tropical seed may be helped by mild stratification if they have been overdried. No one knows. Even in the tropics there are seasons & specific best times of year to germinate. Fresh wet tropical seed should not need chilling however. Desert living plants may not have enough cold or moisture to break down abscisic acid. It would take too long to leach out at that moment when water is suddenly available & they must quickly sprout. Instead they use toxic phenolic compounds, which will also avoid the seed being eaten by animals. These compounds are freely water soluble, hence the ability of the desert to spring to life instantly with flash floods which leach out the phenols overnight. I don’t know whether any Passiflora use phenols. Some of the P. foetida group would be likely candidates. They grow like weeds in the wild, often in very dry climates, they will even grow on sand dunes. These seed are usually so easy to germinate that they may not contain any inhibitors at all. If they do contain phenols in theory they should keep well if stored dry. Australian plants such as P. cinnabarina which grow in areas subject to bush fires may need fire (i.e. heat & extreme drying to a level of 5% or lower?) followed by moisture to break dormancy. Setting fire to pine needles in a tobacco tin, with the seeds in a bit of soil underneath, has been recommended! It is not quite clear what element of the fire does the job & how. For bigger seeds with thick walls the fire splits or cracks them. P. cinnabarina however germinates with soaking in smoke solution so it may be that the chemicals in the smoke together with the moisture break down as yet unidentified germination inhibitors. In fact Ian Webb has had a P. cinnabarina seed just germinate in the soil over winter from a fallen fruit but perhaps the above treatments would germinate a higher proportion.